An Urban Explorer's Guide to the Buffalo-Niagara Region: Unique Landmarks, Historic Gin Mills, Old World Neighborhoods, History and More! New facade added to McCarthy's in 06-07. After completion of the Erie Canal in early 1800's, many Irish workers who built "Clinton's Ditch" settled in Buffalo. The area historically known as the First Ward became home to these hearty pioneers who worked in the nearby grain elevators and manned the many Lake Erie frieghters which docked only blocks away. Nestled among industrial buildings, multi-family homes and a network of railroad tracks is Gene McCarthy�s Tavern (73 Hamburg Street). McCarthy's is still a favorite of grain workers (General Mills), fire fighters, police and politicians. When the breeze shifts in the right direction, the warm smell of roasting Cheerios engulfs the neighborhood. Watch-out of the "live" train tracks only feet away from the front door! There are the followers and the leaders. The non-doers and the doers. The people who cry into their beer, and the people who rise and pour the beer. Gerhardt Yaskow is one of the latter. "My friends say I'm always looking on the bright side," he says. "But I see what is." Others look at Buffalo and see bleakness. Yaskow, who is 34 with wide-set, Slavic eyes, saw opportunity. He began buying, restoring and reselling old homes. You don't have to be Donald Trump to do that here. Now, he is part-owner of a Frank Lloyd Wright house, as well as the historic Coit House, which he plans to turn into a bed-and-breakfast. Last winter, Yaskow began poking around the Old First Ward. "I wasn't lost," he reflects. "There was the HSBC tower, the Cobblestone District." But as an Allentown yuppie of Polish, German and Ukrainian descent, he felt a bit disoriented. Then God sent him a sign. "For Sale," it said. It was in front of Gene McCarthy's Tavern. 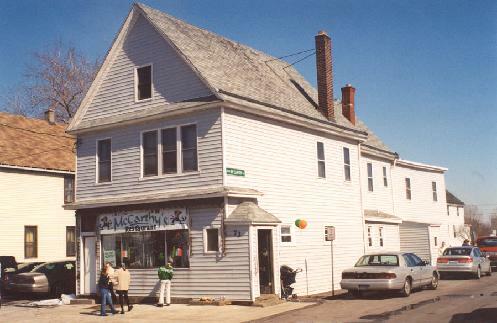 Even in the phone book, McCarthy's looks ancient: "McCarthy Gene Tavrn 73 Hamburg." The century-old tavern is tucked between houses and still-in-use railroad tracks, a stone's throw from the grain elevators. Treading in the footsteps of countless sailors and grain scoopers, Yaskow pushed open the heavy door. 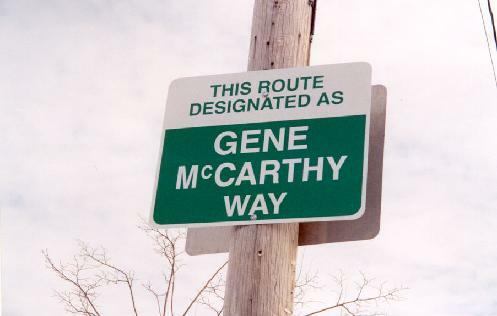 He learned that 80-year-old Gene McCarthy was retiring. Yaskow took in the vintage wooden bar, wainscotting and tin ceiling. He fell in love. He had tended bar before. Plus, his grandparents had once owned a Polish tavern near the Broadway Market, the area where he grew up. He decided those were credentials enough. He bought the bar - er, pub. "It's not a bar," Yaskow says. "It's a public house, where people don't go to get drunk, but to talk, to exchange ideas." Edward O. Smith, distinguished professor of history at Buffalo State College, nods approvingly. "This is a classic Irish pub, a place to come and have conversation," says Smith, enjoying a dark draft one sunny afternoon. "They don't allow swearing, either. The notion is that you could bring in your family, and it would be appropriate." Yaskow chimes in that McCarthy's wife, Mary, used to forbid bad language, and so will he. He may not be Irish, but he respects tradition. Patty Avent, who has cooked at the pub for 25 years, is staying on. Last week, a call found Yaskow at a bingo supplier on Clinton Street, buying balls for a game of chance. Someone had mistakenly tossed the originals, and regulars were frantic. Yaskow added historic photos and stained-glass images of grain elevators by local artist Lou Fisher. He had his old upright piano restored and moved that in, too. He drafted his sister Suzette to tend bar and replaced box wine with bottles. He puts in 50 hours a week, but doesn't mind. "I can't do this as a hobby, because I am in the prime of my life," he declares. Just two months have passed since McCarthy, in a crowded ceremony, handed the pub over to its new owner. It could be too soon to tell if Yaskow's passion is love or infatuation. But it sure looks like love. The tavern has calmed him, slowed him down in a good way. Before he found it, he was dealing in fast-track neighborhoods, dabbling in politics. Now, he admits those pursuits are on the back burner. Pub ownership has settled over him like a good marriage. He wears it with dignity and grace. Take care of our city, his story hints, and it will take care of us. "My generation, a lot of them complain and run," Yaskow says, pouring a guy a Bud. "I've never been interested in living outside Buffalo. Look around. The grass is not greener. You can create anything you want." The owners know well the keys to longevity. Walking into McCarthy's Restaurant is like electric sliding into the '60s, just forget the bell-bottoms. This no-frills yet charming Irish pub has been serving lunch to Buffalo's First Ward since 1963. One can only imagine the brokering that occurred under the barroom's tin ceiling. We picked a Friday at noon to sample its wares, and it became clear that owners Gene and Mary McCarthy know well the keys to longevity. For one, they both work here. 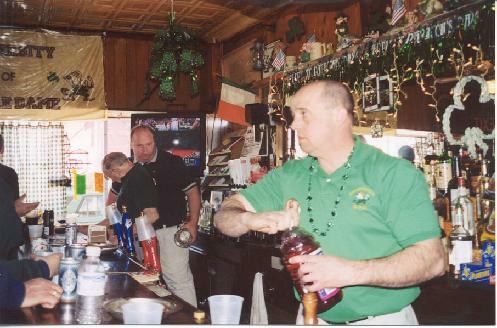 Pop in at lunchtime, and you'll find Gene behind the bar - if he's not in Florida with the tavern's social club. Mary, meanwhile, works the kitchen. No easy task, considering on Fridays - the only day McCarthy's serves dinners (4 to 7 p.m.) - the deep-fryer runs on overdrive. The prices, meanwhile, appear frozen in time. Fish frys run $5.50; mini-sized at $4.50. Roast beef sandwiches go for $3.75; open-faced at $4.50. A bowl of chili costs $1.75, the same for french fries with gravy. This is pure pub food, appealing to most everyone - even the South Beach dieter who opted for chili with a side of salad. The dieter, who tossed the croutons, gave rave reviews to the chili: "Most places have a ton of beans," he said. "This is the real deal - beef-heavy." The shrimp basket at $5.50 featured about 40 unadulterated shrimp - swimming in a basket, accompanied by cocktail sauce and lightly deep-fried. (Mary works the fryer well.) Similarly priced, the scallop dinner with fries and slaw features a dozen sea scallops served hot with perfectly opaque centers. A small fish fry was just that - one wee haddock, moist and crunchy. Order a Genny draught, and Gene can oblige. Ask for a glass of red wine, and the befuddled server will bring a light, fruity, cherry-red substance that fills each glass to the rim. While quaffable, it may have tasted better with ice. "What kind of wine is it?" we asked. "Red," was the answer. Two points: Order beer and expect no-frill service. Take notes: There is no lock on the door to the women's restroom. The thick tables for four are true card tables in that they have built-in drink holders for spill-proof dealing. And Wednesdays are turkey days, which means a hot roast turkey sandwich comes smothered with fries and gravy for $4.50, and a cold turkey sandwich with lettuce, tomato and mayonnaise is $2.75. McCarthy's is a slice of the past - a watering hole favored by lawyers, politicians, First-Ward regulars and their mothers. Gene McCarthy's Tavern serves lunch daily from 11 to 1:30 p.m.; dinner is served Friday from 4 to 7 p.m.